Here in the UK our patios don’t get much use during the cold winter months. A combination of the freezing temperatures and wet weather can leave even the hardiest outdoor areas looking a little neglected and in need of some TLC. Cracked grouting leaves gaps between stones – where weeds will flourish come spring – and the overall look can be very messy. To get back on track and smarten up your patio, whether you’re doing so with the hope of selling your property or you simply want to enjoy a tidy outdoor space, follow this step-by-step guide on the best way to grout a patio. Grouting a patio needn’t be a difficult job, or a time-consuming one. To achieve a perfect end look, start off by completely saturating the area to be repointed. Use a hosepipe and / or watering cans to ensure every inch of your patio is thoroughly soaked. Distribute the water across the patio tiles using a yard brush. 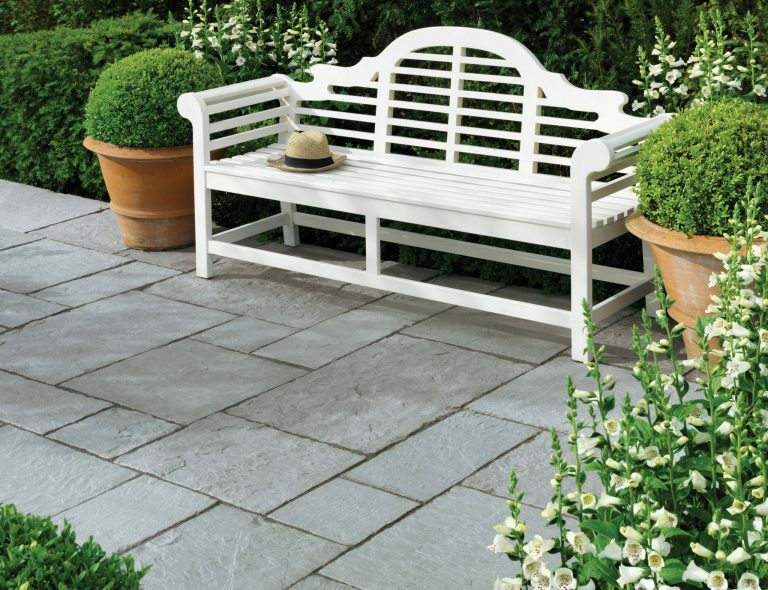 Use a good quality jointing compound like Marshalls’ Weatherpoint 365 to achieve an attractive finish on your patio. This will save you time on the job compared to simple mortar, which can’t be used in wet weather. Plus, with a mortar jointing product, staining can occur on your patio flagstones. Weatherpoint 365 won’t cause staining while you’re patio jointing and is straightforward to use – simply pour a generous amount of the product over your newly soaked patio. Next, carefully sweep the grouting product into the joints. Take your time to make sure that every joint is fully filled with the compound, as this can help prevent premature cracking in the years to come. Once all your joints are full of compound, sweep aside the excess product and begin to strike it in. Use a metal tool to make doubly sure the product is firmly pressed into each gap and no spaces are left. Having finished filling the holes with compound, it’s time to sweep up the excess. This specific compound product can be kept for future use, so pop the extra back into the tub, fill the tub with water and seal. How long the compound will take to cure, or set hard, depends on the weather conditions in which it is laid. In dry summer conditions it will take around 72 hours for the compound to be completely set and for the patio to be ready for use. If you’re experiencing very wet or cold conditions, the product should be given a full 28 days to totally harden. Learning how to grout a patio and doing the job properly will pay huge dividends over the years, leaving you with an attractive and tidy outdoor space you can enjoy whenever the weather allows.